What takes place in the privacy of the artist studio? What is it like to experience an artist at work? These two programs answers these questions through short films that reflect a variety of cinematic styles due in no small part to each filmmaker’s close relationship to their subject. Common to all the films is how artists allow their filmmaker friends into their studios to capture their process, their method of making art. The result is an intimate dialogue between filmmaker and artist that remains open ended and exploratory. Total running time: ca. 85 min. In spring 1951, the artist-organized Ninth Street Show catalyzed the formation of artist-run galleries in lower Manhattan. The show’s location – in a vacant store at 60 East Ninth Street – and the opportunity to see recent works by more than fifty established and emerging artists drew attention to inexpensive spaces east of Broadway. Rents for vacant commercial properties along Tenth Street were under $100 per month, and the low cost attracted groups of artists to rent space under cost sharing agreements, a system known as “co-ops.” By the late 1950s another gallery type emerged, the short-lived, self-financed galleries that focused on experiments in artists’ lofts in various downtown neighborhoods. Experimentation incubated new art practices – environments, performance, geometric objects, participatory art, and political art. Importantly, artists were themselves defining and promoting the projects. Artist galleries supported more than the visual artists who exhibited; the spaces became vital centers for dialogue and debate, forging alliances across disciplines, and among poets, writers, critics, musicians, photographers, and filmmakers. Artist galleries radically expanded the parameters for visual art, and in so doing the artists and the exhibitions they produced became an important subject for filmmakers. This four-part series of short films examines three themes inspired by New York’s Downtown gallery culture: “Lives of Artists,” intimate portraits of artists at work; “Exhibition as Stage,” subjective views of artist performances that resonates as part documentary and part visual experiment, and “Artists Make Movies,” searing statements in film or video representing the artist’s aesthetic concerns. 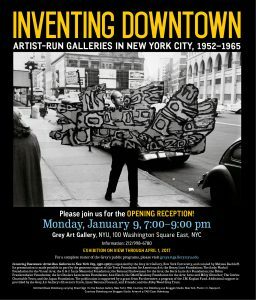 This series is presented in conjunction with the NYU Grey Art Gallery’s exhibition “Inventing Downtown: Artist-Run Galleries in New York City, 1952-1965,” which is on view January 10-April 1; for more info, visit: greyartgallery.nyu.edu. And for further Anthology programming relating to the exhibition, click here and here. Art Gallery); and to Jennifer Bertani (WNET); David Callahan & Elena Rossi-Snook (New York Public Library for the Performing Arts); Rebecca Cleman (Electronic Arts Intermix); Eleni Gioti (Light Cone); Mike Kuchar; Alfred Leslie; Claes Oldenburg; MM Serra & Joel Schlemowitz (Film-Makers’ Coop); Michelle Silva; Chelsea Spengemann (Stan VanDerBeek Estate); and Robert Whitman.